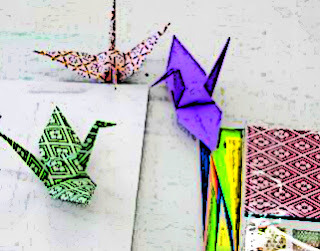 Please join me at my studio, Painting Paradise, in Waimea on Sunday, December 30, 2012 at noon for an afternoon of Origami Peace Crane folding to honor the victims and families of Sandy Hook. No folding experience is needed as I will demonstrate and have directions handy. I will be serving tea and coffee and some pupus and will provide the paper. Feel free to bring a snack to share and some origami paper (if you have any extra). 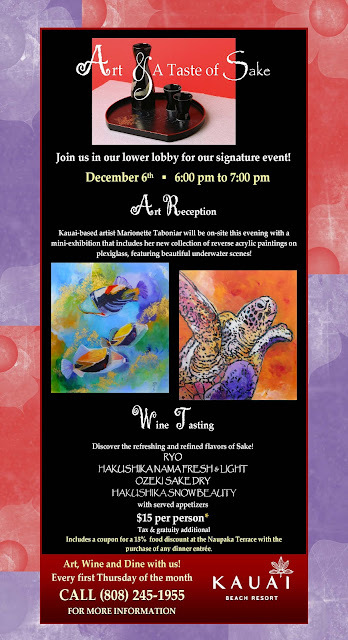 Our monthly Art & Wine event returns next week Thursday, December 6th ……and tonight we‘ve got something special for our attendees! For the month of December we are featuring a special evening of Art & Sake! The price to attend Art & Wine is $15 per person (tax & gratuity additional) which includes the wine tasting and a light menu of served appetizers. This price also includes a dining coupon good for a 15% food discount off of any entrée purchased for dinner at the Naupaka Terrace. The coupon will be good for 1 month from the date of this event and is not combinable with any other offer. It will be given out at the event to individuals who pay to attend - limit 1 coupon per person. 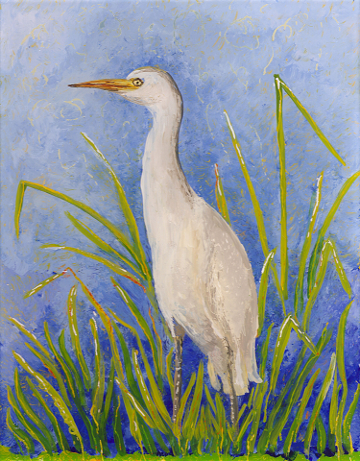 This discount offers attendees a great opportunity to enjoy the art & wine, then stay on-site for dinner that evening or return later to dine. 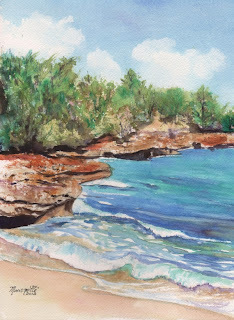 Kauai-based artist Marionette Taboniar will be on-site this evening with a mini-exhibition that includes her new collection of reverse acrylic paintings on plexiglass, featuring beautiful underwater scenes! "Reverse" acrylic means it has to be painted in a reverse method from the normal way of painting. In other words, the details have to be painted first with the background added last. Marionette is currently painting underwater scenes of turtles and fish using this method and adds a touch of "gold" paint which gives the piece a sparkle when held in the light at the right angle. 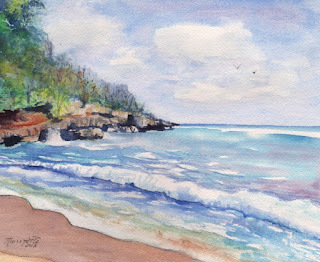 Marionette fell in love with Kauai in 1992 and has been painting "Hawaiian Style" ever since. 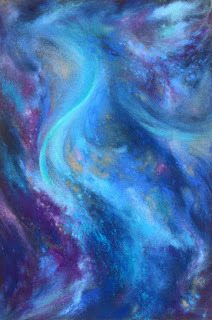 Her works include the techniques of acrylics, encaustics, silk painting, watercolors, and pastels and can be found in public and private collections around the world. 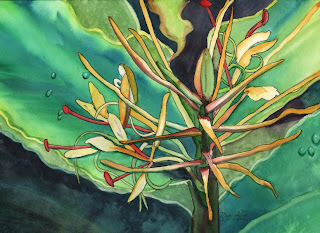 Her latest commercial commission was "Tropical Bamboo II" a 22"x30" watercolor for Design Studio of Honolulu this summer. 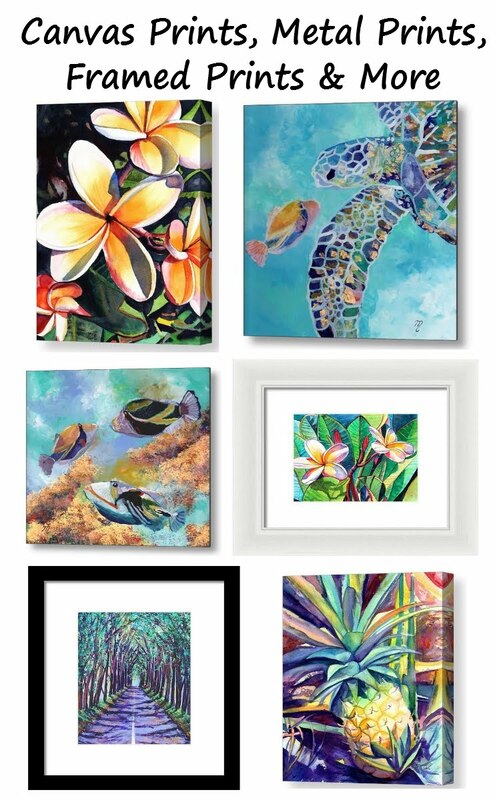 She has also created numerous designs for Kauai Coffee Company. For over five years Marionette has been operating her studio, Painting Paradise, in Waimea where she teaches a variety of classes. 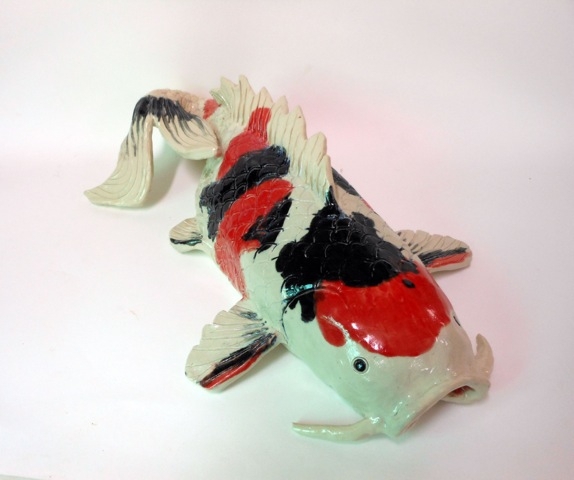 In her spare time she enjoys fishing and going to the beach with her husband, Joe. For more information about Marionette and her art, please visit www.kauai-artist.net. Ryo is sprightly fresh sake smooth and luxurious as it enters, leading to a subtle bitterness for an impression of dry sake. Brewery: Chiyomusubi Sake Brewery Co., Ltd.
Made by a brief aging period and pasteurization right before bottling, Fresh and Light Namachozo is characterized by a refreshingly cool aroma and mild taste. Smooth, mild sake with refreshing aroma, aged at a cool temperature before pasteurized. Brewery: Tatsuuma-Honke Brewing Co., Ltd.
Ozeki Dry is a smooth, dry and light-bodied sake with refreshing fruity flavor. Tastes best when served chilled. Brewery: Ozeki Sake (USA), Inc.
Non-filtered sake with rice flavor and mellow finish. Velvety in texture with a pleasant fragrance of freshly steamed rice. This Nigori sake (roughly filtered sake) a traditional favorite. Creamy with a mild sweetness, this sake is deliciously unique. Appetizers prepared by Executive Chef Mark Sassone and his culinary team will be served to accompany the featured wines of the evening. Live music with Jonah Cummings begins at 6:00 pm in Shutters Lounge that evening. 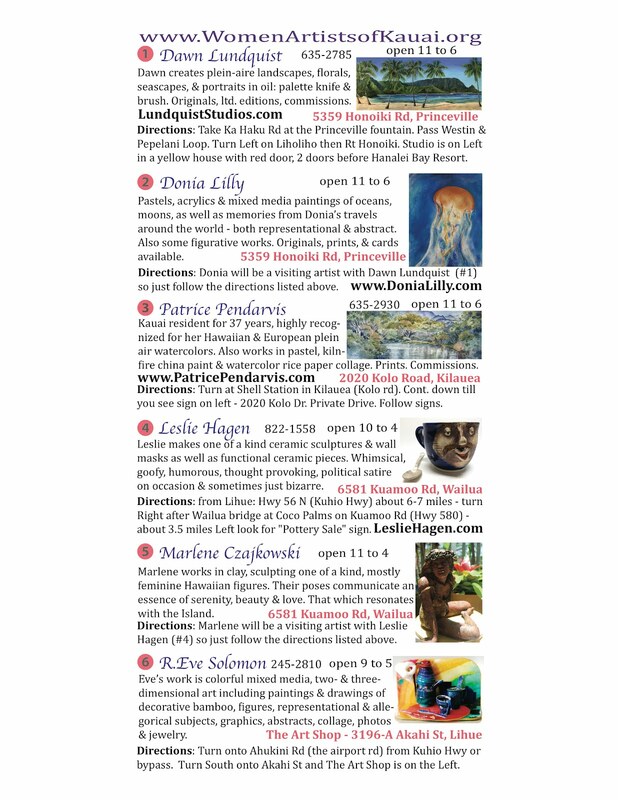 Great holiday fun, food, live music, and shopping at the 4th Annual Holiday Fine Art Festival featuring original paintings, photography, pottery, sculpture, mixed media and more! A portion of the proceeds will go directly to HUCC's Free Community Lunch program offered every Thursday from 11:30 a.m. to 12:30 pm. Participating artists include Patrice Pendarvis, Anna Skaradzinska, Dawn Lundquist, Helen Turner, Marionette Taboniar, Leslie Hagen, Caylin Spear, Donia Lilly, Debbie Barklow, and Rhonda Forsberg. Live soothing guitar music will be provided by Dr. Matthew Miller. 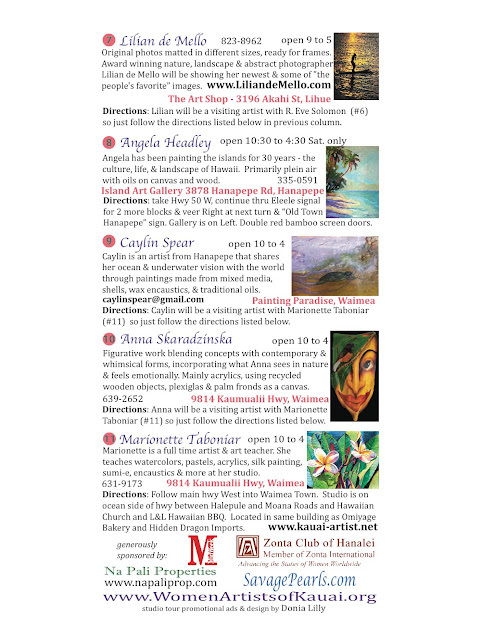 Plus, The HUCC "Lanai Cafe" will be serving sandwiches, soups, salads, baked goods, and beverages. Admission to this fun, family event is free. 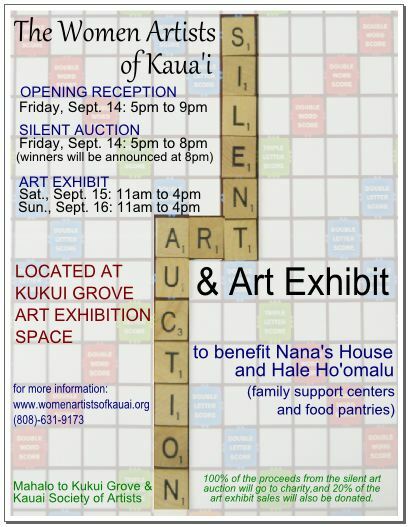 The festival will be located at the Hanapepe United Church of Christ Fellowship Hall which is right next to the Hanapepe library. 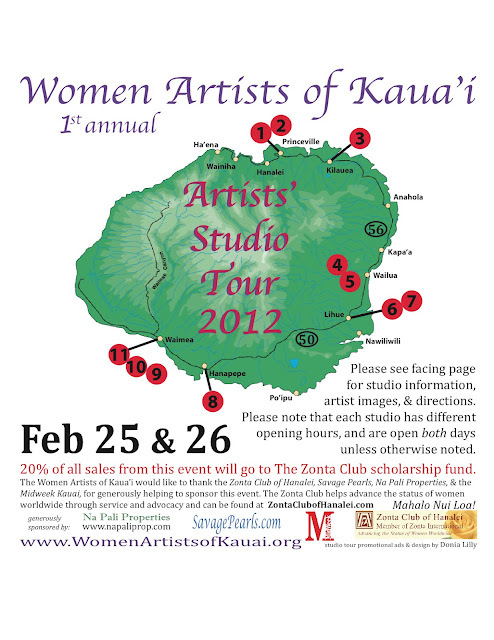 The Women Artists of Kaua‘i promotes the works of female artists on the island while raising funds for local charities on Kaua‘i. 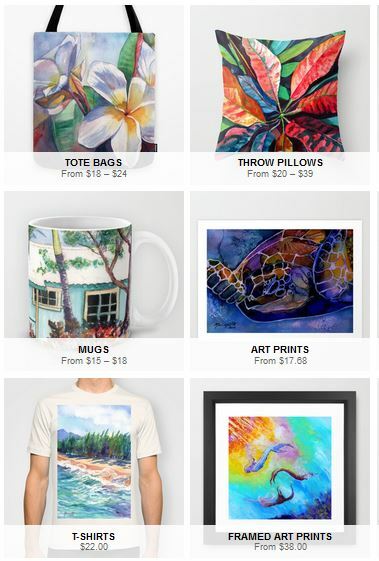 All works are original, consisting of paintings, prints, photography, drawings, sculptures, mixed-media, metal, glass, fabric and textile art, or digital art. 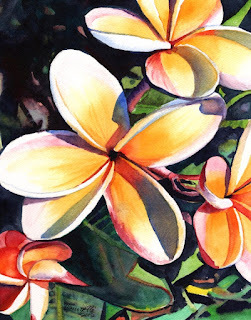 Have you ever wanted to paint gorgeous, sunlit, tropical flowers? Well, this class is for you! 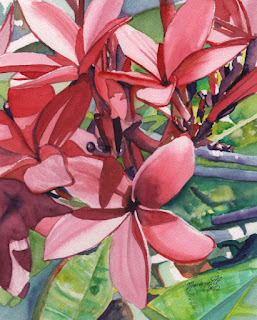 Whether you are a beginner or an advanced artist, I will demonstrate my techniques to create two vibrant plumeria paintings in this online class. No drawing skills are necessary! 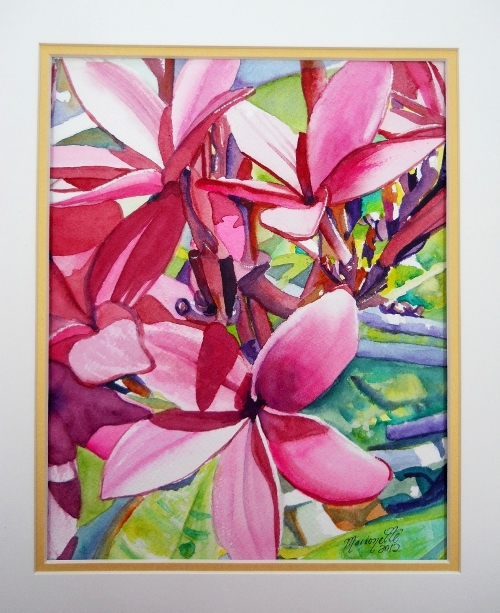 In this class you will receive my two reference photos to print out of the Pink Plumeria and Rainbow Plumeria. 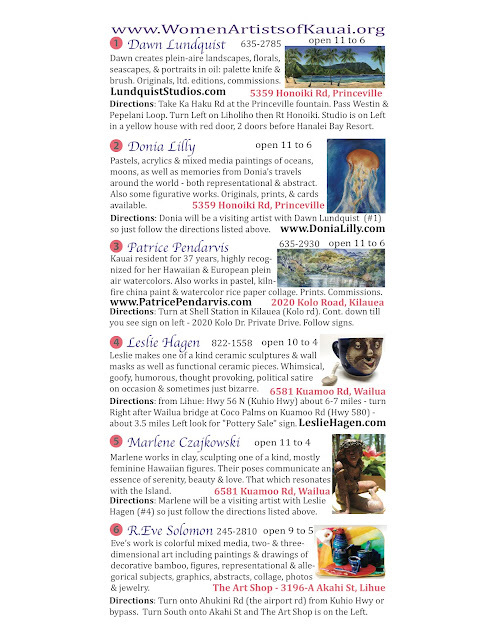 Plus, you will receive my exact art supply list with links to the Blick Art Materials website. This makes ordering your supplies easy, or you can use the links to see photos of what the supplies look like if you want to purchase them at your local arts and crafts store. During the ten videos where I demonstrate the Pink Plumeria and eleven videos of the Rainbow Plumeria, you will gain an understanding of how to properly use quality watercolor supplies, how to correct mistakes, how to blend and shade the delicate plumeria petal, layering, and much, much more. Plus, I will be available either by email or phone during the three weeks of the class to answer any questions and to provide additional assistance. *All videos and emails will be available for at least three months after the end of the class so that you may work at your own speed. The videos will be embedded in the email so that you just have to click the photo of the video to be taken to the actual video. All videos in this class are "private" which means they are only available to those in the class. *The first email for the class will go out on August 17, 2012 and will contain the reference photos for you to print out, the supply list, and the first video for the Pink Plumeria so you can start your first drawing. *The second email will go out one week later on August 24, 2012 and will contain the next nine videos for the Pink Plumeria project. *The third email will go out on August 31, 2012 and will contain the eleven videos for the Rainbow Plumeria project. 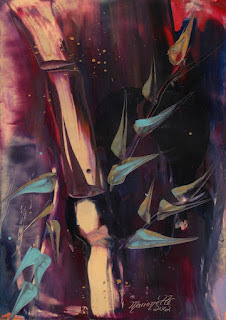 *If you wish to have a private critique of your painting, just send me a .jpg of your painting attached in an email, and I will be happy to do so. Class registration is now closed. Stay tuned for a future class. 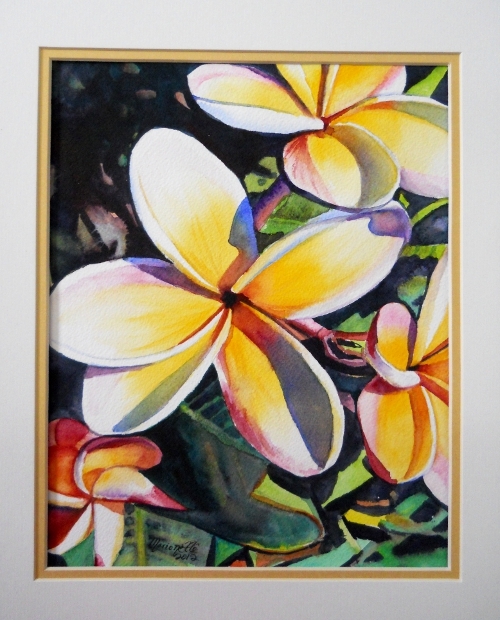 Mahalo for signing up and Happy Painting!!! These can all be purchased though my Etsy Art Gallery at www.kauaiartist.etsy.com or by contacting me directly at Marionette@kauai-artist.net .